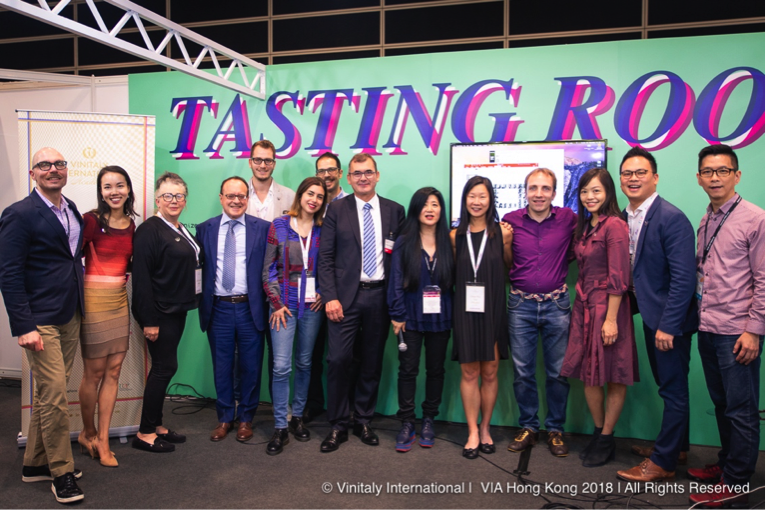 10th edition of Vinitaly International Academy, Hong Kong: on November 8th, 2018, two new Italian Wine Experts and seven new Italian Wine Ambassadors officially joined the Vinitaly International Academy (VIA) community of dedicated wine professionals worldwide. These new Ambassadors and Experts successfully completed the re-formatted, tasting-intensive VIA Italian Wine Ambassador certification course held in Hong Kong at the Hong Kong Convention and Exhibition Center in the lead up to the International Wine and Spirits Fair. Left to right: VIA Faculty Henry Davar and Sarah Heller MW; Gill Gordon-Smith, new IWE from Australia; Veronafiere General Manager Giovanni Mantovani; Luca D’andrea new IWA from Italy; Giulia Mengoni new IWA from Italy based in Australia; Francesco Marchio, new IWE at the first try from Italy but based in Hong Kong; Veronafiere President Maurizio Danese; Stevie Kim, Vinitaly International Managing Director; Phyllis Wan Yin Chan, new IWA from Hong Kong; Sebastian Wöll new IWA from Germany but based in China; Alice Wong, new IWA from Hong Kong; Anson Wan, new IWA from Hong Kong; Vincent Yuen M.S., new IWA from Hong Kong. This was our 10th edition and it was a bit tricky as we were implementing a newly-formatted Ambassador course, which was characterized by key elements of innovation aimed at strengthening the candidates’ knowledge of Italy’s distinctiveness in viticulture and winemaking and enhancing the candidates’ tasting skills. I am pleased with how it went and confident that VIA is on the right track to educate wine professionals abroad to the complexity and quality of Italian wine in an effective and thorough way. VIA Founder Stevie Kim (center) with VIA Faculty members Sarah Heller MW (left) and Henry Davar (right). 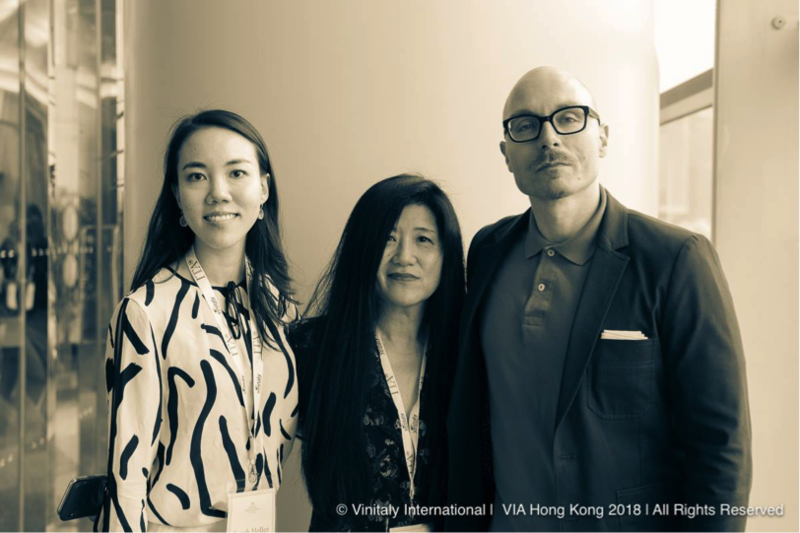 Over the course of four days, it became clear that the VIA class of Hong Kong 2018, first individually, and eventually collectively as a group, had begun to fully understand and embrace the mission statement of VIA and the true nature of the ambassadorship. Having gained a stronger grasp of the Italian cultural heritage and viticultural landscape, they started to recognize in themselves the potential of championing the diversity and uniqueness of Italian wine. The enhanced tasting component of the course included tastings led by the VIA Faculty and additional self-guided Tasting Labs. In total, VIA Ambassador candidates tasted 85 labels of Italian wine coming from the 20 regions of Italy. The addition of the new Tasting Labs was particularly welcomed by these professionals; in Hong Kong, these Labs featured wines coming from Abruzzo and Alto-Adige. I’ve been immensely impressed by the enthusiasm of our students, some of whom have traveled from as far away as the US and Mexico as well as all over Asia to take part in this first new edition. They’re highly engaged and really seem to be embracing the new, more structured format based on the insightful, informed questions we’ve been fielding all week. Also, the group video project seems to have accelerated the community-building that is another key pillar of this project. New VIA Italian Wine Ambassador certification courses will run in 2019 in Verona, Italy, in the lead-up to Vinitaly from March 29th to April 2nd (registrations are open) as well as in a number of locations in the United States and Asia soon to be announced. Left: VIA candidates at work on the group video project; Right: VIA candidates practising tasting during one of the Tasting Labs organized in collaboration with Italian wine consortiums.